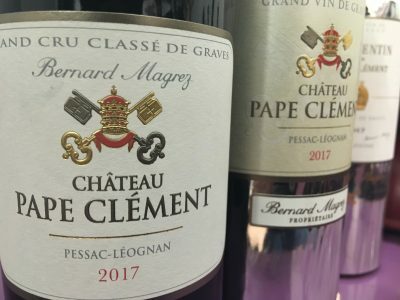 Château Pape Clément was badly affected in volume terms by the damage wrought by the April frost in 2017. At the property, in Bordeaux’s suburbs in Pessac, production for the red was sixty percent down and fifty percent for the whites. Other properties elsewhere in Bordeaux owned by Bernard Magrez were affected even more significantly. Château La Tour Carnet in the Haut-Médoc, for example, lost 70% of production. At Pape Clément, despite the considerably reduced crop, and the knock-on effects in terms of blending options, the quality is excellent. The white is very exciting. It is full and deep but not overblown. The Pape Clément red is typically layered and lush, with lots of black fruits. The following wines were tasted during primeurs in 2018. Full and direct; some grapefruit and passionfruit notes; some sea salt too; attractive. Has nice race; full, real breadth; works well. Nicely balanced. Grapefruit and citrus tones; some lychee notes; but not overblown; works very well. [55% Sauvignon Blanc and 45% Sémillon, 65% new oak, ageing in 15 in egg shaped containers, rest one-year old barrels]. Tasted April 2018. Drink 2023-2030.